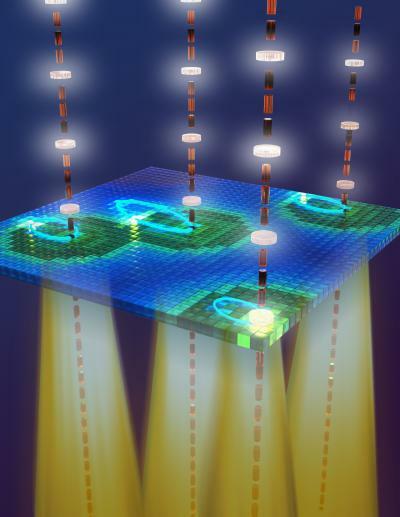 By aiming high- and low-frequency laser beams at a semiconductor, physicists at UC Santa Barbara have produced multiple frequencies of light simultaneously, with the potential to significantly increase the speed of data communication. They did that by causing electrons to be ripped from their cores, accelerated, and then smashed back into the cores they left behind. When the high-frequency optical laser beam hits the semiconductor material — in this case, gallium arsenide nanostructures — it creates an electron-hole pair called an exciton. The electron is negatively charged, and the hole is positively charged, and the two are bound together by their mutual attraction. “The very strong, low-frequency free electron laser beam rips the electron away from the hole and accelerates it,” explained Mark Sherwin, whose research group made the groundbreaking discovery. Sherwin is a professor of physics at UCSB and a co-author of the paper. He is also director of the campus’s Institute for Terahertz Science and Technology. “As the low-frequency field oscillates, it causes the electron to come careening back to the hole.” The electron has excess energy because it has been accelerated, and when it slams back into the hole, the recombined electron-hole pair emits photons at new frequencies — up to 11 in their experiment. The electron-hole recollision phenomenon has the potential to significantly increase the speed of data transfer and communication processes. One possible application involves multiplexing — the ability to send data down multiple channels. Another is high-speed modulation. The researchers utilize a free electron laser to produce the electron-hole recollisions, which they note is not practical for real-world applications. Theoretically, however, a transistor could be used in place of the free electron laser to produce the strong terahertz fields.